The aim of the study was to assess the economics for a conceptual open cut pit that would enable a significant portion of the deposit’s Indicated Resource to be mined. A preliminary internal project development time line shows first production is possible within 12 to 15 months, subject to permitting and funding. Results suggest an internationally competitive delivered cost onto Chinese rail for a washed hard coking coal. The 2017 drilling and sampling program which is budgeted at US$1.5 million is planned to confirm the study assumptions. The Nuurstei Coking Coal Project is located in northern Mongolia and is held in the Ekhgoviin Chuluu Joint Venture (ECJV) with the Noble Group. It contains a JORC resource of 4.75 million tonnes in the Indicated category and 8.1 million tonnes in the Inferred category. Nuurstei can be viewed as a starter project which assists with the development of Aspire’s much larger and 100% owned Ovoot Coking Coal Project which is 160 kilometres further to the west. Aspire plans to confirm the study assumptions with the planned 2017 drilling and sampling program which is budgeted at US$1.5 million. Conversion of Nuurstei’s exploration license to a 30 year mining license is well advanced as the company works towards a potential operational start in 2018. Furthermore, Aspire has the option to increase its ownership to 90% in the project through the payment of $1 million and royalties. Nuurstei provides Aspire the opportunity to generate both cash flow and useful operational and logistics knowledge to assist in the development of the much larger Ovoot project. The project could also benefit through future access to the planned Northern Rail Line just 70 kilometres to the south. Given a successful 2017 drilling and sampling program and access to required funding, it is possible for a 2018 start to mining operations. Aspire is the largest coal tenement holder in Mongolia’s Northern provinces, and the key to unlocking the deposit is infrastructure. 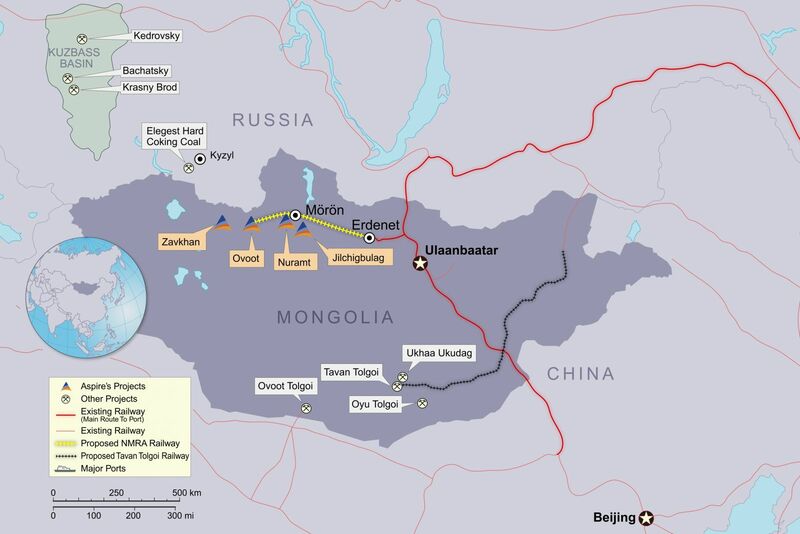 Production from the company’s Ovoot Project can coincide with the commissioning of the Erdenet to Ovoot Railway. Aspire stands to potentially gain significantly from China’s One Belt One Road policy, one of the world’s largest infrastructure initiatives.